If you're looking for professional and reliable machinery transport in Perth, Reef Group is the answer to your needs. Reef Group offers machinery transport across Western Australia, including (but not limited to) the areas of Albany, Bunbury, Busselton, Esperance, Geraldton, Manjimup, and Port Hedland. The company has a fleet of modern vehicles designed for heavy equipment and machinery transport, including HIAB crane trucks, low loaders/drop decks, and tilt tray slide trucks. Western Australia a state where cities are few and far between. Despite its somewhat inhospitable facade, WA’s agricultural, mining, and petroleum industries have grown and contribute to the state's (as well as the country's) economy and prosperity. As these industries expanded, the demand for machinery (both new and old) and for machinery transport in Western Australia have also spiked. Reef Group has the capability to transport earthmoving equipment, such as backhoe loaders, bulldozers, crawl loaders, excavators, forklifts, motor graders, and more for companies in the construction and mining industries. We also offer reliable machinery transport services (conveyor systems, food processing equipment, injection moulding machines, fabrication equipment, and more) for clients in the manufacturing industry. We’re committed to providing safe and reliable transportation of elevated work platforms (EWPS), shoring boxes, construction site accommodation, building supplies, and portable ablution units. For those in the agricultural sector, Reef Group offers dependable and on-time delivery of tractors and other farming equipment to the Western Australian countryside. We also specialise in transporting shipping containers to numerous ports across Western Australia. Reef Group offers reliable short or long-distance machinery transport for customers based in Perth and across Western Australia. We cater to small startup companies eager to compete in the market, as well as larger companies who have established a formidable reputation in their industries. Apart from delivering heavy machinery and equipment on time, we also prioritize the safety of all people involved in the process, as well as ensure that your goods are delivered on-site intact and secure. We have a fleet of modern trucks that are maintained and serviced regularly. All our drivers are required to possess a White Card and are licensed to perform jobs in high-risk industries. In addition, they are trained in implementing correct loading and restraint procedures to prevent damage to your equipment. If you need reliable, safe, and professional machinery transport in Western Australia, give Reef Group a call or enquire online for a quote. We take pride in our knowledgeable and professional customer service team. Whatever your machinery transportation needs—whether you want to transport a shipping container from Perth to Port Hedland or a tractor to any of the towns that lie within Western Australia's Wheatbelt region, we’re always happy to help. If you are at a loss about which truck suits your needs, send us a message or give us a call and our team will be more than happy to discuss your options. Looking for a safe and reliable partner for your machinery transport needs in Western Australia? Here are a few reasons why Reef Group is your best choice. 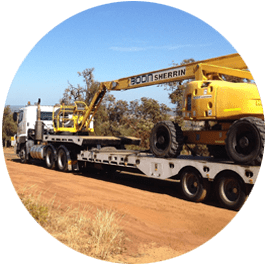 Reef Group has been in the business of machinery transport and other heavy haulage transport across Western Australia for more than 15 years. From a single truck, Reef Group has grown by leaps and bounds over the years and now owns a modern fleet of trucks that can cater to your transport needs no matter how big or small. Our team also has a combined 40 years' experience in the transport industry, making it one of the most reliable transport companies serving West Australian clients. Whether it's a single shipping container, multiple forklifts, or gigantic earthmovers, you can be sure that Reef Group has the right solution for you. Our team can provide you with the right vehicle (or vehicles) and adjust our schedule to fit your company's needs to deliver your machinery and equipment on time at the designated destination. Transporting your equipment across Western Australia safely is our top priority, so we make sure that we comply with all occupational safety and health (OH&S) regulations laid out by the regulating bodies. All our vehicles are maintained regularly and repaired promptly should the need arise. We have a rigorous hiring process for our drivers to make sure that we hire only the best. Once hired, our drivers' knowledge of the latest safety regulations are regularly updated. Reef Group offer on-time dependable machinery transport in Perth and across Western Australia. We know that any delay can adversely affect your business, so our drivers and our whole team work hard to deliver your equipment and any machinery you plan to entrust to us right on schedule. Ready to discuss your options when it comes to machinery transport in Perth and elsewhere in Western Australia? Contact Reef Group at 08 9454 3724 for your options, as well as a comprehensive quote for all your machinery transport needs.